As a young man, and long before he became an award winning wine producer, the closest Brett Butcher got to sharing in the spoils of creating an artisan elixir was watching his father brew up a storm of ginger wine in their Nambour backyard. Since those days growing up in a little Queensland town Butcher has worked tirelessly to bring his dream of becoming a wine maker to life and has just been awarded for his efforts with double gold—for one wine, Soumah’s 2013 Single Vineyard Chardonnay—at the recent Sydney Royal Wine Show. But that journey from country boy to a ’97 points’ double-trophy winning wine producer has not been a straightforward one. In fact, in the beginning, Butcher didn’t even like wine that much, let alone foster a dream to make it. Heading off to university to study hospitality that all changed when he began the ‘wine appreciation’ component of his course; Butcher’s palate and world exploded open. So taken by the wine bug was he Butcher decided to change degrees to study wine-making. Unfortunately, university officials wouldn’t grant any credits across degrees and, without the finances to start again, Butcher committed to finishing hospitality. Degree done he took a job as a trainee restaurant manager and found himself under the wing of his manager, another wine enthusiast and, more importantly, the proud owner of a garage full of wine. Each lunch break the too fast friends would share a bottle (or two! ), exploring together the wines of the time (Richmond Grove Chardonnay, Mount Pleasant Semillon) and some vintage Redman Claret. As fun as those lunch time sessions were, Butcher sensed there was more to discover and so applied for a graduate exchange program, one that saw him move to Boston, Massachusetts, USA in the early 80s. Rising through the ranks of the hospitality game, Butcher travelled the world as he was posted from one hotel to another. Eventually he rose to the top his profession, becoming the CEO of Langham International and basing himself in Hong Kong. Whilst travelling the world managing a global team Butcher was able to sample some of the best wines, in the places from where they came. Slowly, a passion and deep respect for the importance of terroir, grape selection and winemaking style took hold. So too did his latent dream to make wine. And, upon an exploratory trip to the Yarra Valley (Victoria) in 2005 Butcher found the perfect vineyard to lay down vines. Yes, it had fallen into disrepair, but the location—close to Melbourne on the north face of the Warramate Hills; prime grape-growing land, and feel—there was a dam AND a cute little house—was right. Perfect in fact. Then, for the next four years, Butcher watched over the replanting and rejuvenation of his very own vineyard, looking forward to producing his first vintage in four years, what would be 2009. However, when the fires raged through the Yarra Valley on Black Saturday in 2009—and smoke taint ruined what grapes weren’t swallowed by the tragic inferno—Butcher was forced to scrap any plans to make his first wine. 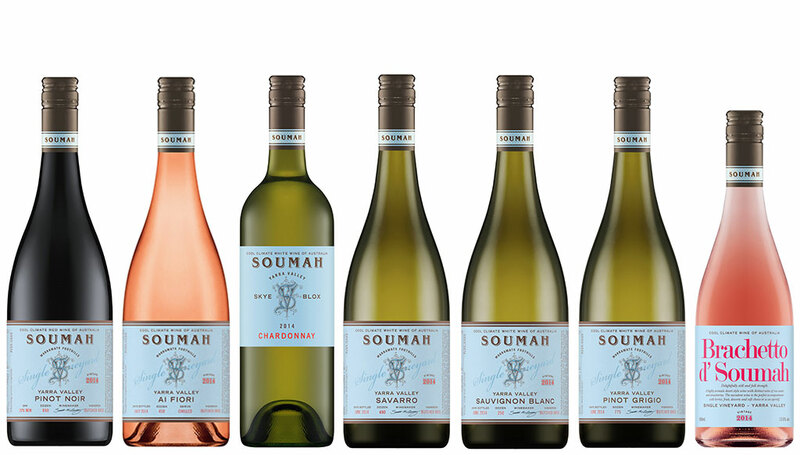 A year later in 2010, and following one of the best vintages in decades, Butcher bottled his first wines under his own label, Soumah, producing Chardonnay, Savarro (Savagnin), Viognier and Shiraz. Since then he has added other varietals: Pinot Grigio and Sauvignon Blanc (enormously popular Soumah whites), Brachetto (a sweet Italian varietal) and Pinot Noir. Nebbiolo is slated for release within the next year sometime too, and you get the feeling Brett Butcher might even one day go full circle and dig out his father’s old ginger wine recipe! Now that would be gold. Maybe even triple! This entry was posted in Feature Article and tagged ai fiori, brachetto, Brett Butcher, chardonnay, pinot grigio, pinot noir, sauvignon blanc, soumah.